Our very own Berlin Style Currywurst Ketchup. We’ve been working long and hard to bring you a bright and spicy Currywurst Ketchup that will keep you licking your chops for more. We’re now proud to introduce our very own Berlin Style Currywurst Ketchup. Trust us, the sweet heat on this all natural, gluten free ketchup will have you tapping the bottle dry. You can also recreate Schaller’s Stube at home with our Currywurst Combo pack. 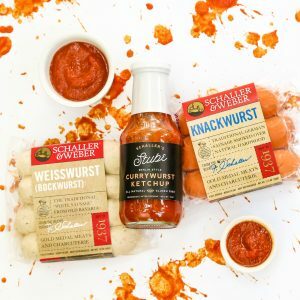 You already know and love our Bavarian Style Sweet and Spicy Mustard and Düsseldorf Horseradish Mustard, so get to know this Schaller & Weber soon-to-be classic on top of Schaller & Weber wursts: Knacks and Weiss.